While skeptics still scoff at the term gamification, Badgeville keeps gaining the trust of big companies and investors, who believe in its power. Badgeville announced Wednesday it raised $25 million in a round led by Interwest Partners, bringing total funding to $40 million to date. The cash influx reflects the progress Badgeville has made in turning its gamification tools into a larger platform as a service, which is becoming popular with large enterprise customers. The company now has more than 165 clients including Oracle (s orcl), Deloitte, Dell (s dell), Samsung, NBC, The Walt Disney Company (s dis), Universal Music, Barnes & Noble (s bks), eBay’s X.commerce (s ebay) and others. Badgeville’s latest funding also puts it ahead of rivals such as Bunchball and Big Door, which have also raised about $13 million each to date. Badgeville has worked to grow beyond gamification, or the incorporation of game mechanics to motivate employees and consumers to do specific tasks. It now integrates more social networking, reputation and analytics, giving enterprise customers a fuller set of tools to measure and influence behavior. The company now tracks more than 3 billion behavioral actions per month across tens of millions of users. Gamification is expected to only grow in the coming years with Gartner predicting that 70 percent of global 2000 companies will have gamified applications by 2015. The market for gamification could be worth $2.8 billion in the U.S. by 2016, according to M2 research. As I wrote before, I believe Badgeville’s moves to expand gamification make sense. It’s about giving corporate clients tools to build loyalty, behavior and engagement, and gamification is just one part of that. 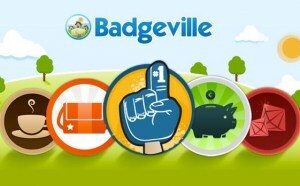 By combining game mechanics with other tools, Badgeville can try to be a go-to behavior engine for enterprise clients. The new money suggests that it’s one the best positioned to do that though it will still face competition from fellow startups and companies like Salesforce (s crm), which is also bulking up on social tools for companies including the purchase of social performance platform Rypple. And here I thought you had come up with a clever play on words with “gamification has legs”, reading it as gam-ification instead of game-ification. Too bad, though the sight of Larry Ellison’s legs would be scary, no doubt.